I've been admiring the Dorset Buttons that Queenie is making and adding to her crazy quilt project. You can see the block she is working on this week here. Last night I decided to give it a try. Using a one inch plastic ring and varigated DMC perle #5 in color 4060, I made this. 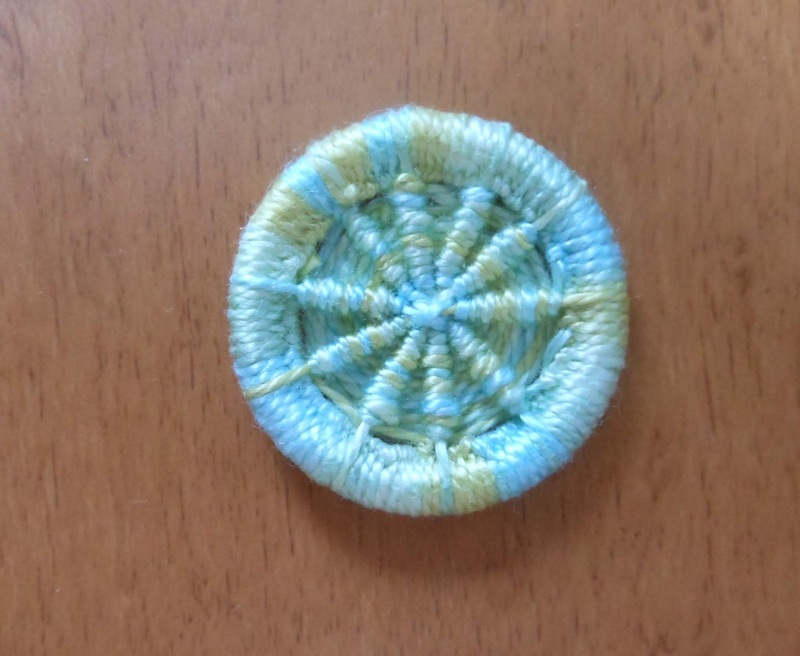 It's a beginner's button, but I think I will make more and try to get better. You can find many interesting images of dorset buttons on the internet. Be aware, this can become an addictive activity! Your first button in far better than my first try was. On Pinterest there are lots of ideas, but you will come up with your own, too, I am sure. Very pretty. I’d love to try this soon too! Fascinating! I've never come across Dorset buttons before. Lovely Dorset button Pamela, I made some a couple of years ago but didn´t really know what to do with them as they have to be quite large to see the stitching. Good idea about using them on a crazy quilt blocks. Queenie's projects are inspiring aren't they? Nice job! I have a project that requires some. Need to get back to it some day. I like your Dorset Button. I always admire them, but wonder what to do with them. I'm such a Left Brain thinker. It may be a beginner button but it is a very nice beginner button. A very creative technique, Pamela. And you can use such buttons for so many things to embellish.